Suffolk County Legislator Sarah Anker, Congressman Lee Zeldin with Boy Scout Troop 161. Shoreham, NY - January 11, 2017 - On Saturday, January 6, Suffolk County Legislator Sarah Anker joined Boy Scout Troop 161 at St. Mark’s Church in Shoreham for an Eagle Scout Ceremony honoring Ryan Doolan, Ryan Ledda, Tyler Offut, Charles Vesely, and Dominic Vesely. Eagle Scout is the highest rank that a scout can receive and requires the scouts to earn 21 merit badges, complete a community service project, and undergo a lengthy review process. 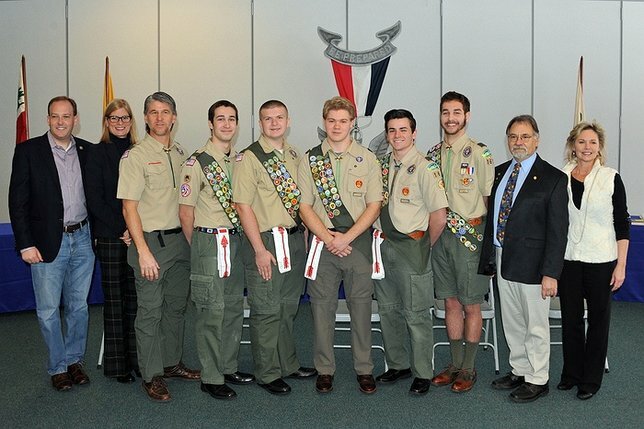 Subject: LongIsland.com - Your Name sent you Article details of "Legislator Anker Honors Eagle Scouts from Shoreham Troop 161"